We've been thinking a lot about motherhood lately -- what motherhood truly means. And a line from William Ross Wallace's famous poem came to mind, "The hand that rocks the cradle is the one that rules the world." Isn't that the truth? So, we decided to really celebrate all the moms in our lives! 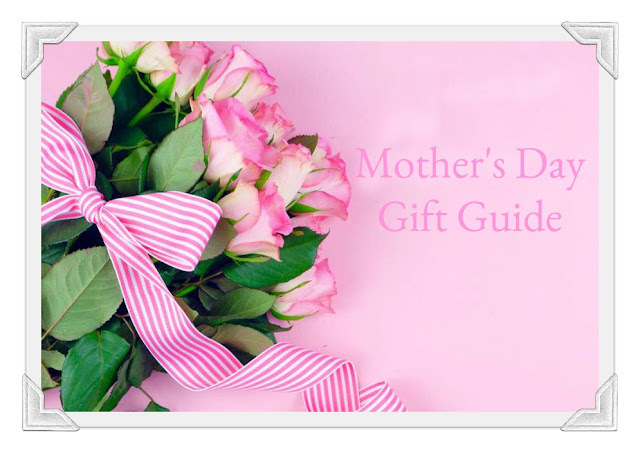 And, in case you've forgotten, Mother’s Day is Sunday, May 12 so you have plenty of time and we have plenty of ideas for those perfect gifts! 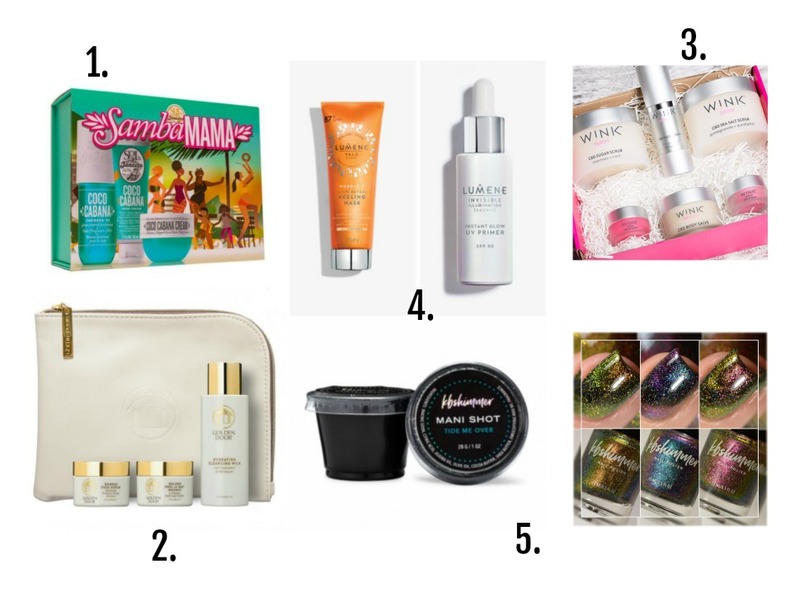 Sol de Janeiro Samba Mama ($42) - This limited edition Mother’s Day gift set includes the new Coco Cabana Cream Moisture Magnet Oil-in-Water Body Cream, Coco Cabana Body Fragrance Mist, and Coco Cabana Hand Cream. All deliciously scented. Golden Door Try Me Kit ($28) - Since we discovered the Try Me Kit, it has become a staple for travel. The Kit contains TSA approved sizes of the Golden Peel-A-Way Masque, Bamboo Face Scrub, and Hydrating Cleaning Milk that are a combination guaranteed to bring life back to tired and dull skin! Wink SPA Essentials Kit At HomeSpa ($198) - The perfect at-home relaxing spa moment for Mom -- this kit includes full size Detox Sea Salt Scrub, Purify Sugar Scrub, Relieve Body Salve, Renew Facial Serum, Repair Lip Scrub + Restore Lip Balm duo. Lumene Glow Reveal Peeling Mask ($15) paired with Lumene Instant Glow UV Primer SPF30 ($25) gives mom a radiance enhancing mask that helps tired and dull skin to recover a luminous, smooth, and youthful glow instantly. And then, she can protect her face with a non-greasy, lightweight primer formula that glides on effortlessly and provides SPF30 protection. KBShimmer’s Mani Shots ($2.50 ea) - We love, love, love and for this price you can pamper mom without going broke. These delicious mani/pedi soaks are available in an array of scents and are the perfect quick spa treat that leave hands and feet super soft. Pair them up with the new KBShimmer's Launch Party 2019 Collection. The Launch Party Collection ($30) is an on-trend space-themed set that is perfect for mom with hues like "Moon On Over," "Universal Appeal," and Sol Mat," -- all featuring micro holo flakes add sparkle and shine to this magnetic flake top coat. The set includes a KBShimmer Neodymium Ring Magnet for the perfect magnetic manicure. 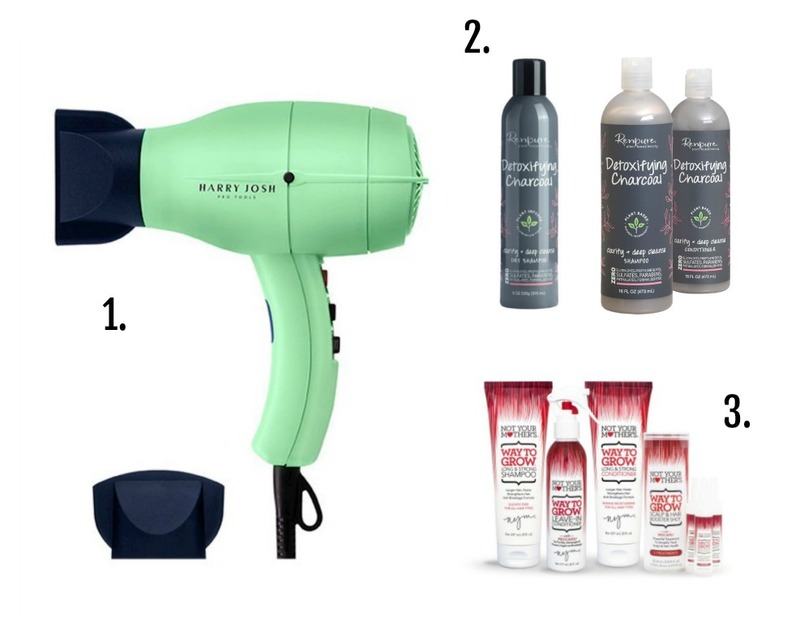 Harry Josh Pro Tools Pro Dryer 2000 ($249) - Give your mom some extra time for herself this Mother’s Day, with this Pro Dryer she can create a salon like blowout in half the time her average dryer performs. This dryer also has a true cold shot button to set her style and minimize frizz. Renpure Detoxifying Charcoal Clarify + Deep Cleanse Collection ($8.99 ea) - Infused with mint leaves, wild fern and violet to help clarify and keep hair and skin oil free, the Detoxifying Charcoal collection will deeply cleanse and remove impurities without completely stripping the good stuff. Not Your Mother's Way To Grow Collection ($27) - This haircare set includes shampoo, conditioner leave-in conditioner and Scalp & Booster Shot -- all infused with essential vitamins, herbs and bioactive extracts that will revitalize winter weathered locks! 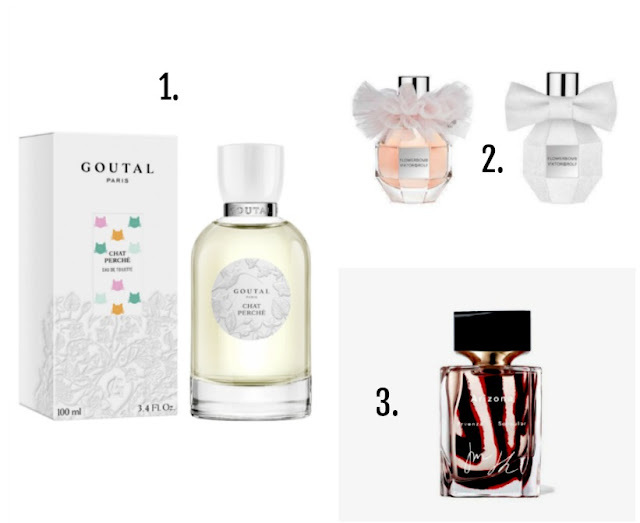 Viktor&Rolf Personalization Factory - Exclusively on Us.Viktor-Rolf.com, personalize a fragrance for your mother this Mother’s Day. Choose the color of your Flowerbomb bottle, dress it up with an accessory and engrave it for the final personal touch. Arizona Collector Edition ($100) - Proenza Schouler’s newest release, the Arizona Collector Edition-the original scent reimagined with a new, limited-edition bottle that just launched during NYFW. The bottle now features their bold, archival print from their Spring 2017 runway show, the bottle features designers Jack McCollough and Lazaro Hernandez signatures and comes with a designer pouch. Bridgette Thornton Paint + Petals Apron ($34) - Designed by Bridgette Thornton in collaboration with Anthropologie, this vibrantly hued apron brings a cheerful touch to any kitchen. Mason Jar Measuring Cups ($7) - This stylish Mason Jar Measuring Cups features a design inspired by vintage canning jars. Use each layer of the jar to measure liquids or solids; after cleaning, stack the durable ceramic cups into an aqua blue mason jar for a cute countertop display. Rifle Paper Co. Recipe Box Herb Garden - The perfect addition to bring cheer to any kitchen. Each box features a gold metallic interior and a gold label frame on the front. Floral Twill GardenGloves ($38) - With extended cuffs that protect against scratches, insects and sun exposure, these cotton twill gloves are a practical choice for the gardener. 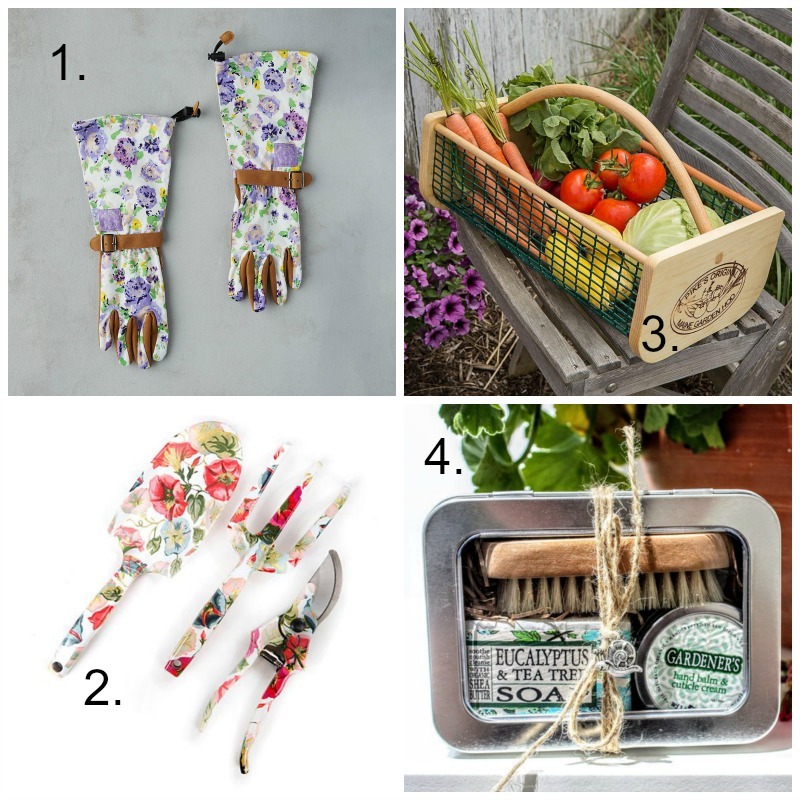 Morning Glory Gardening Tool Set ($48) - Make getting mom's hands dirty a delightful way to welcome spring with the Morning Glory Gardening Tool Set. 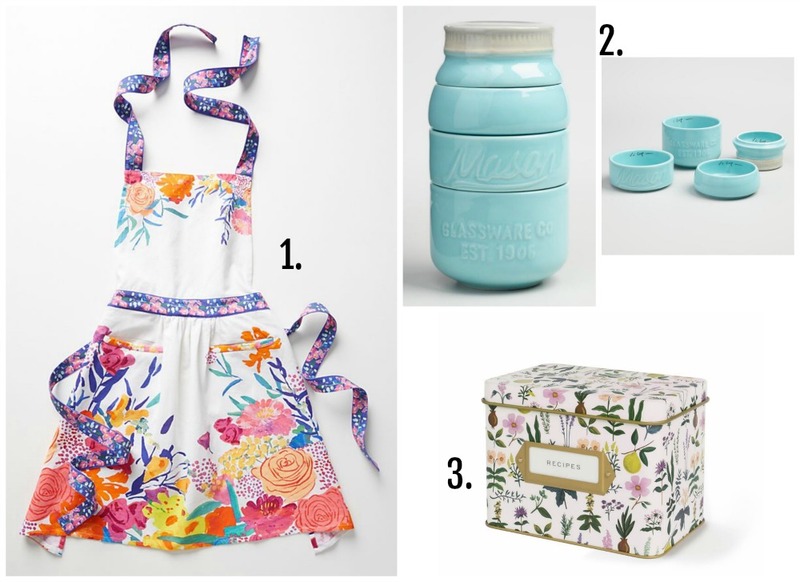 Featuring cheerful decals of dawn’s favorite flower, this three-piece set is the perfect gift for a green thumb who likes to dig in bright and early. Gardener's Gift Tin ($24) - Here's a perfect gift for Gardeners who love to toil in the earth's soil. Set includes Gardener's Healing Balm and Cuticle Cream, a bar of organic eucalyptus and tea tree soap, a natural two sided nail brush and is packaged in a reusable window tin. Maine Garden Hod Garden Basket - For generations, New England clam diggers have relied on these sturdy hods to stow and clean their day's catch. Now "inlanders" can enjoy their around the garden, yard and home.